The tool can be downloaded at the following link and includes the .ps1 source file. If you’re like me, you want to have instant access to your phone, in a safe manor, no matter where you are. A couple years ago I discovered a magical product from a company that was at the time called UDS. This “Magical Alien Sticky Pad” was named PuGoo, a strange name for a rather amazing product. The original PuGoo was 8″x4″ and I owned a couple of them. I could stick my 10.1″ original Galaxy tablet to the wall next to my bed all night, without fear of it crashing down on me, waking me up. 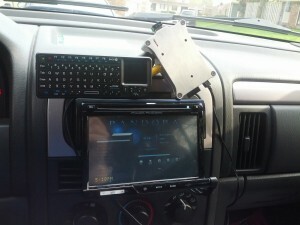 I also had one in my Jeep, for securing my phone, and occasionally my tablet, into my dash. When it lost it’s tack, it was as easy as running it under cold water and letting it dry, then BAM! good as new! The PuGoo was sold out for a while, and mine had finally degraded from abuse and misuse, as well as losing one of them. I contacted UDS, which had become 2040 Studio, a few times and expressed my want for another PuGoo. Last month, 2040 Studio asked if I was interested in testing a PuGoo Mini – after I had backed their ARC Nesting Dock and purchasing a Capta for my upcoming honeymoon. The PuGoo Mini measures about 1.5″x2.25″ and is made for smaller applications, such as phones. It’s the perfect size for most everything I used my larger pad for, while being a lot easier to place and transport. While testing, I was able to affix my Nexus 7 tablet to the side of my nightstand overnight, with no problem, I could see it being able to hold larger devices as well without issue. 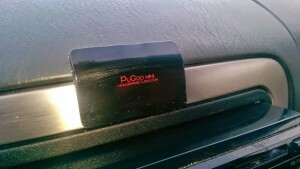 Currently I am using the PuGoo Mini to secure my cell phone to my dash in my Jeep, as pictured above. I combined it with an NFC tag, and when I place my phone on the pad, it syncs to my stereo (JeePi) and opens my media application. I have had it there for hours, without any issue, and without having to worry about my phone falling. I have had to clean the pad a few times, and just like its bigger brother, it’s as good as new each time. The one issue I have had, is it seems to get slightly less sticky after sitting in the hot vehicle all day, but as soon as it cools down, the tack comes back. Currently the PuGoo Mini is only in testing stages, and is not yet released, however, 2040 Studios is gauging interest for the product, and there is talks of a future KickStarter for the PuGoo Mini. If you are interested in the PuGoo Mini, check out 2040 Studio and email them at info@2040studio.com, letting them know you’d be interested in purchasing one, be sure to let them know you read about it here! Thank you for reading my review/preview of 2040 Studio’s PuGoo Mini and thank you 2040 Studio for giving me the unique opportunity to test the product! Project JeePi – Raspberry Pi Car Computer! I spend a lot of time in the my Jeep (2004 Grand Cherokee) and I normally either listen to NPR, Podcasts or Pandora while driving. 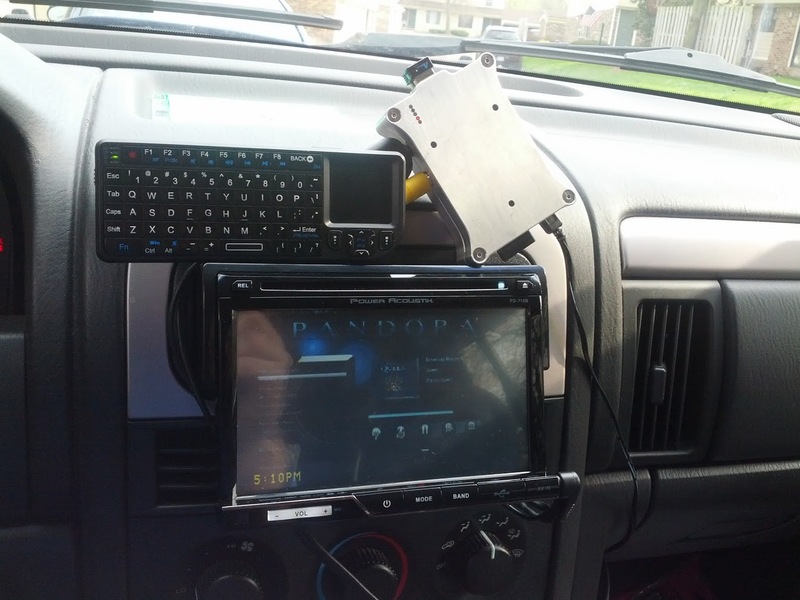 I wanted a way to interface Pandora directly to my Jeep without spending a bunch of money. After researching I devised a plan that would get me what I wanted for about $200, a fraction of the $400+ dollar units. I already had a Raspberry Pi Computer [LINK] laying around, 512mb model and it was already housed in the perfect case, an indestructible Cool Trays Aluminum Case [LINK]. The RPi is a $35 dollar computer with 512mb of RAM and an ARM Processor, prefect for projects like this! So it’s been a couple of solid months of using the retail version of Microsoft Windows 8 and in my last review I bashed it pretty hard. I have still been using an “after-market” start menu, different from mentioned before. Pokki Menu [Link] is now my weapon of choice. I still use the “Modern” menu on an extremely limited basis, but I have hooked up a 2nd monitor, a 20″ LCD, to accompany my 30″ Dell LCD, and having that for the menu makes it more useful, however I am still seeking a solution to make the menu always open on the 2nd monitor and stay open, suggestions? Windows 8 seems quick and performance wise, I am extremely happy. At this point, I would say, if you’re still running Windows 7 and contemplating upgrading, do it, get used to it, I don’t think the new UI is going anywhere soon. I have “upgraded” my server hardware as well. I was running a Dell PowerEdge 2850 Rackmount server and loved it, the downside was, the CPUs didn’t support virtualization. I decided to utilize some hardware I had around the house, namely an AMD X4 and hard-drives and buy a new motherboard and load it up on RAM and NICs. Currently the server is sitting with 16GB of memory, but I plan on filling the other 2 slots with another 16GB in the very near future. Software wise, I am running Windows Server 2012 Core on it and couldn’t be happier. In it’s current state I am able to spin up 6 Hyper-V Virtual Machines on it with little effort. Management of all the VMs are made simple by the amazing new Server Manager included in Server 2012, one centralized point to manage servers and the roles and features installed. RunAsAdmin is an application to help adhere to the best practice of least privileges. 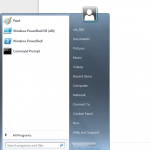 It creates an .exe that the user can double click and it will execute a program with elevated privileges. Users must be in a local group in order to execute the process. I decided to start a sort of a mini-series on my blog exploring some rather interesting and sometimes downright annoying aspects of my Windows 8 experience. Start menu takes up entire screen… okay, this is a given, and I’m starting to get a used to it, but its still distracting to hit the start button and the entire window gets engulfed. 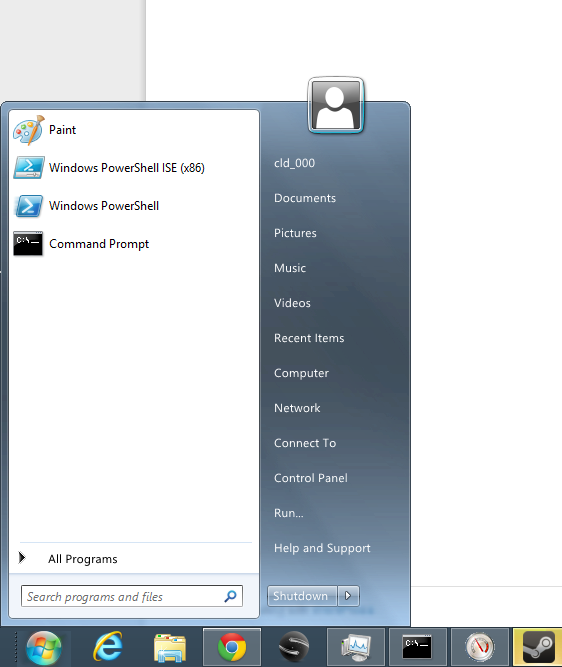 I did however find a nifty little app that will actually restore the start-menu. There are actually a couple of options, one of which is Stardock’s Start8 [LINK] but that carries a $10 price tag. I happen to find Lee Soft’s ViStart [LINK] which is free and does a great job at emulating the start menu. “Mouse Gestures”. Tasks like opening the side or bottom menus in Metro apps require you to “swipe” your mouse from side to side, or top to bottom, its kinda annoying. One cool feature is to be able to “snap” apps to the left or right side of the screen, restoring some of the multitasking capabilities to the OS. However, some “Modern” apps, (like Skype), are completely useless when snapped. As you can see by the screenshot below, the Skype app turns into a Skype banner ad that takes up 1/6th of my screen when I snap it to the side, but if I am in a conversation it will show the chat. Give me my contacts, or anything, is that rocket science? Ever wanted to go through a “simulated” post-data breech to see how well you would be able to handle it? 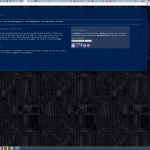 MiSec has posted the files from the Network Forensic Challenge from this year’s GrrCON. It’s also a great crash course on the Volatility memory dump tool and how to use to it help identify the type of attack and the malicious means used to compromise the system. 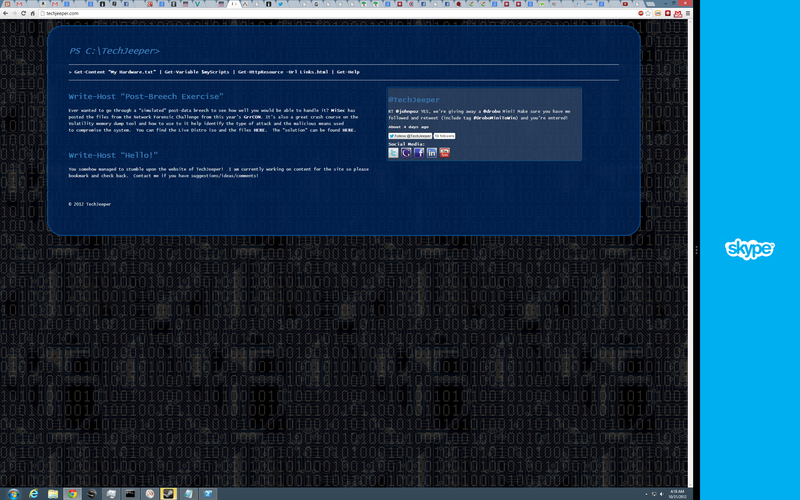 You can find the Live Distro iso and the files HERE. The “solution” can be found HERE.